Molly is now two years old and she pretty much owns this game. She knows to watch the person with the ball and keep track of where it goes. Sky gets too excited and jumps into the water and doesn’t track the ball. Luna just wants to have fun so sometimes you have to make sure she has a chance to get it. We were up early Monday morning and got out of here before 5 am! 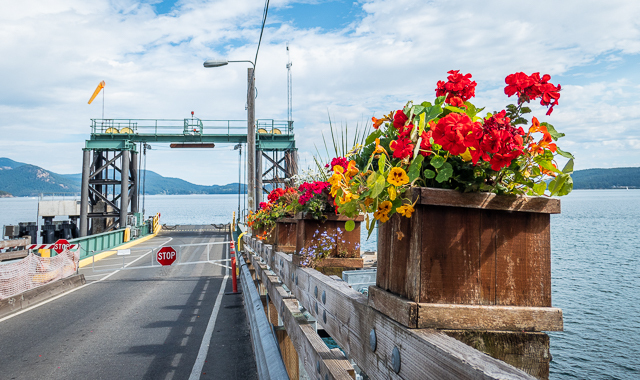 It was a struggle but worth it to catch the 9:30 ferry from Anacortes to Lopez Island. The weather was quite nice over there and we were anxious to try our hand at catching dungeness crabs. We arrived at Odlin Park around midday and set up camp next to some of our Methow Valley friends. Others arrived a little later in the day. It was great to be out of the forest fire smoke and breathe fresh, clean air. The fires have really taken a toll on Methow Valley folks this year, both physically and mentally. The smoke has often been very hazardous to breathe and people are trying to stay inside as much as possible. Most people that move to the Methow are looking for an active outdoor lifestyle. On Lopez, our friend David came by and was ready to set some crab traps and check some that he had put out earlier in the day. It was exciting to see the traps full of crabs. Many of them were not ‘keepers’ and had to be returned to the saltwater but we did find some legal males. All females have to be let go. We spent the afternoon settling in and before dinner time we returned to check and pull the traps out of the water and were delighted to find some more keepers! That evening we all got together for an epic dinner party with crab, spot prawns, pasta, fresh vegetables, dutch oven cobbler and blackberry crisp. The food was amazing and we were all so busy eating that I forgot to make any images. On Labor Day, the pleasure boats were returning to the mainland. Luna likes the ferry but Sky isn’t sure about all the noises.